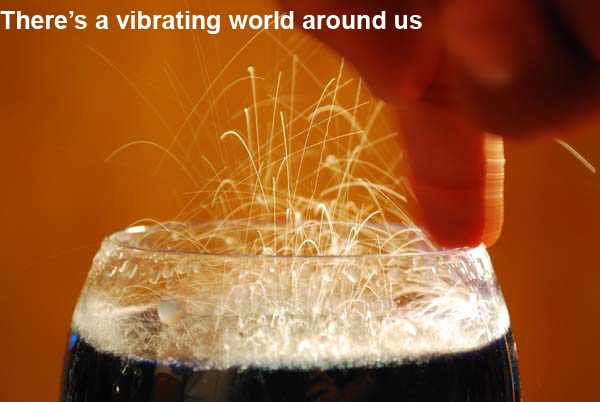 What is Real Vibrations ? This web site is home to a digital database containing numerical time series and spectral representations of experimentally acquired vibration signals. Most importantly, Real Vibrations is a participatory research project that aims at creating the world largest repository of vibrations recorded from everyday life objects and people movements. Cars, trains, airplanes, and even human beings, constantly vibrate and these vibrations can be recorded with various devices and stored in such a way that they are readily available and easily usable both by researchers and non expert visitors. What are these data for? A database of vibration data is a map of the moving world. To many this is of no meaning and little use. To us this is a map of potentially useful energy. In fact vibrations can be efficiently transformed in electrical energy that can be employed to power electronic devices such as wireless sensors: a way to improve the microelectronic world and make a better use of energy. In a near future we believe that this micro-generators that transform vibrations into electric energy will be able to integrate and/or substitute the existing batteries for a better and healthier planet. How to take part in the project ? If you are a scientist or a professional in the energy world, please contact the NiPS Laboratory at the Department of Physics, University of Perugia in order to become a professional partner of the Real Vibrations project. If you are a student and/or a volunteer you can still contribute to this project simply by acquiring vibration data with your smartphone and uploading them to the database. Real Vibrations is developed under the Nanopower project, that acknowledges the financial support of the Future and Emerging Technologies (FET) programme within the ICT theme of the Seventh Framework Programme for Research of the European Commission (Grant Agreement n. 256959).